For clear vision, find the Acuvue weekly disposables that your eye doctor has prescribed for you. Acuvue contacts can offer comfort and reliability for daily use. If this is your first time using these contact lenses, you may want to try a 6-week supply. If you've used them before and know that they're comfortable for you, stock up with a 24-week supply. 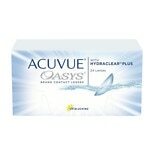 Look for the Acuvue weekly disposables that fit your needs here at Walgreens.com. 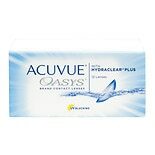 There are additional types of Acuvue contact lenses that you may want to ask your eye doctor about. Acuvue daily disposables generally require little upkeep and daily care. Other lenses are specifically designed for people with astigmatism or other needs. Acuvue also offers multifocal lenses, toric lenses and color lenses. It's important for your vision and comfort that you care for your Acuvue weekly disposables properly. We carry different types of contact solution for rinsing, disinfecting and storing. There are specific disinfecting solutions or saline solutions as well as all-in-one multipurpose contact solution. For storing your lenses, choose from a variety of contact lens cases.